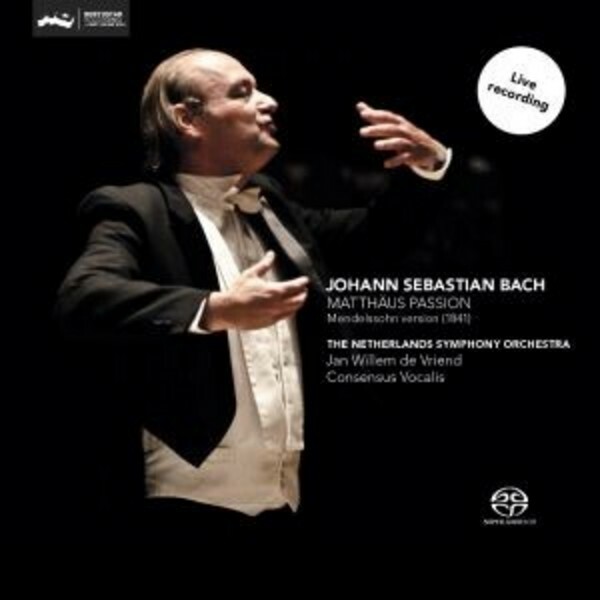 This live recording of J S Bach’s St Matthew Passion features the Netherlands Symphony Orchestra and the group Concensus Vocalis under the baton of Jan Willem de Vriend. It’s a performance that took place at the Muziekcentrum Enschede in April 2014. On 11 March 1829, almost 100 years after the work had last been performed, the 20-year-old Felix Mendelssohn conducted Bach’s St Matthew Passion in the concert hall of the Singakademie in Berlin. Although the previous conductor of the Singakademie, Carl Friedrich Zelter, had decided the work was too difficult to be performed in public, Mendelssohn, who had been a pupil of his, had a different opinion. In 1828 Mendelssohn set to work on the score, making changes in line with the day and age and the instruments then commonly used. After its successes in Berlin, the St Matthew Passion was performed in a number of German cities. In 1841 Mendelssohn gave a performance in Leipzig, where he was then Kapellmeister, in the Thomaskirche - the church where the work had first been performed. On this occasion, Mendelssohn again made alterations to the score, but fewer than in 1828/1829, and it is this version that is used in the present recording.